East of Louisville near Middletown area and I-265 Gene Snyder Freeway. Seasoned firewood available 7 days/week 12 months of the year. Please call or text for details. We can be available 5am - 11pm to meet our customers schedules. We offer premium, seasoned firewood: Ash, Red Oak, Maple, Black Walnut, Hickory - also Apple, Black Cherry, Pecan available in limited quantities for smoking. All of our firewood is fully seasoned for an average of 2 years before we offer it for sale. 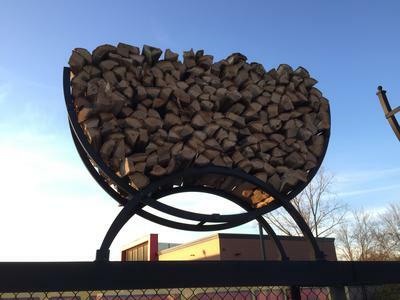 We sell firewood “By the Stack” which can be viewed from our entrance gates $45-$55/per stack. Satisfied customers for 34 years since 1985. We intentionally split our firewood “Into small diameters” which allows: quicker lighting; full burning; easier to handle/carry/stockpile for our customers (see website pictures). Our firewood is immediately cut and split to start the seasoning process. We stack our firewood directly after splitting - on concrete - under a roof - with large solar powered fans to facilitate the drying. We also manufacture Firewood Storage Racks , custom Fire Pits and our bespoke Fire Orbs (see website). Live edge tables and furniture are our specialty with over 700 slabs in-stock and kiln dried ready for your project specification! Additionally we offer land clearing/forest mowing & mulching services for wooded lots, farm pastures, fence lines, underbrush & overgrowth areas, old growth forest cleaning, and right-of-way reclamation. I'd been looking everywhere for good firewood, and had been purchasing those expensive bundles at Kroger most of the winter until I happened past A2's place in January. I called and turned the truck around and once I got a good look at what they had, I was really pleased at the selection, quality, cut size/shape and price of the firewood. This stuff is THE BEST! Burns long and hot and crackles just right on a chilly Winter's night! I'll be coming back for this firewood every year. This is the place to go for fire wood! It's well seasoned, split well and fairly priced. He has different species to chose from too. I also have the medium wood rack. It's sturdy and has not left marks on my patio. Great quality. I have had problems finding wood that will burn the last 2 years and my wife saw these racks for firewood they sell while getting fuel. We love a fire at home and they educated us about the different types of wood they sell and what is best for us - who knew there was such a difference? My wife in now a firewood connoisseur! I’m just glad to have wood thats always ready to burn and I can pick it up late after work or over the weekend. GREAT guys!